I noticed that our bathroom sink has already been worn out and I would like, if possible to upgrade it's design into something different. I want the design to be classy, unique and elegant. If I have to choose the design of the sink, I prefer to have one that will give my bathroom a "spa effect". I, myself is a spa lover. I don't know, but I always derived great pleasure feeling the serene and captivating ambiance of a spa. 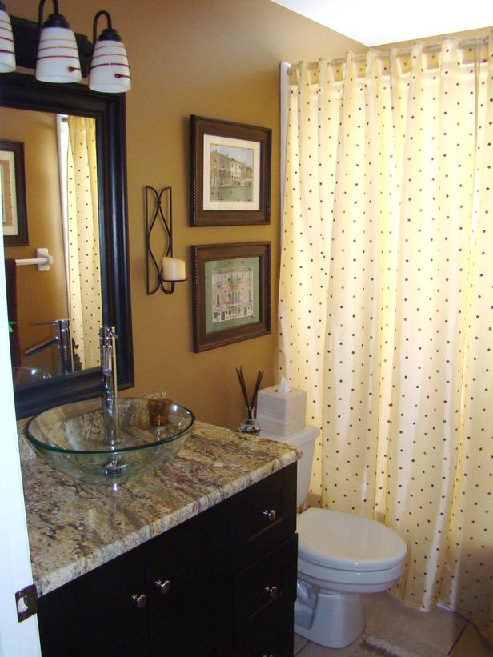 For others, bathroom is the least decorated part of the house. Not for my family. Me, my husband and kids love to decorate our bathroom. In fact, our bathroom have picture frames, hanging organizers, hanging cabinets and a beautifully designed shower enclosure. We also put on display those souvenir shampoos and lotions in small bottles that we derived from some hotels that we've stayed on during our trips (lol). Some bottles come with the hotel logo, so my son and I thought that it would be a good collection. Below are some of the bathroom sink designs that I fantasize and hope to have very soon. Probably, when we construct the additional studio type room on top of our garage. The last design is my favorite. The color combination is extra ordinary and that sink and toilet bowl looks so elegant. 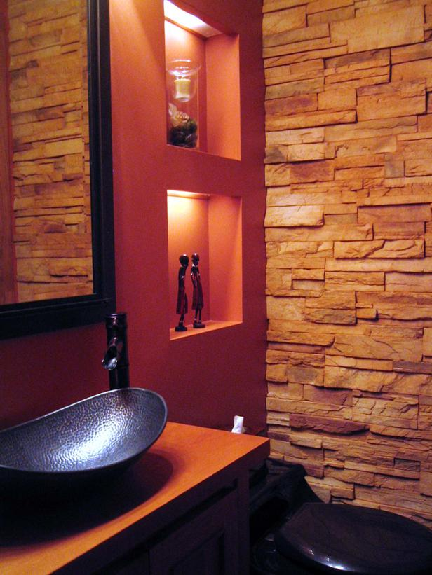 The bricks on the wall is also a good alternative for wall tiles. But if I would just replace the sink in my current bathroom, I would go for the glass sink on the second photo. It looks clean and elegant. What about you? 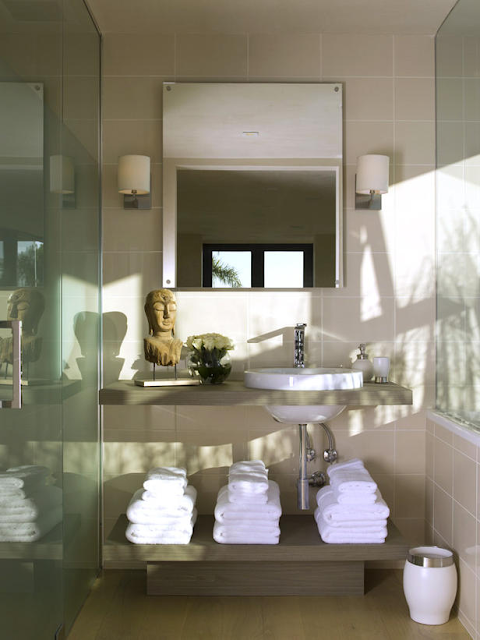 Are you also dreaming of a bathroom make over? This is a timely post since we are renovating our house right now.. I olove all the designs.. I used to lack interest in house / room designs but since we started acquiring a bare-type model house I started looking for designs I might like. The ones you posted are so elegant looking. Oh I saw a similar design (of the last photo) in a Home depot here in QC. It cost 2-3 thousand?! Minus the faucet, you have to buy it separate. I wanted that one but we were going for a more modern chic design for the bathroom. So yeah~ Good luck renovating your bathroom! Thanks for this post. It's time to renovate my bathroom, so this is a timely inspiration. Thanks. I would like to renovate my bathroom but don't think it will be possible at the moment. We did do a sink overhaul and changed the whole thing last year. The last photo is really nice but I prefer the first design looks so clean and refreshing. timely, our house is on renovation and im excited to decorate our bathroom! i prefer dim lights and i agree the spa-effect can give extra feel and ambiance :) show us whats ur final choice! Lovely designs all of them. 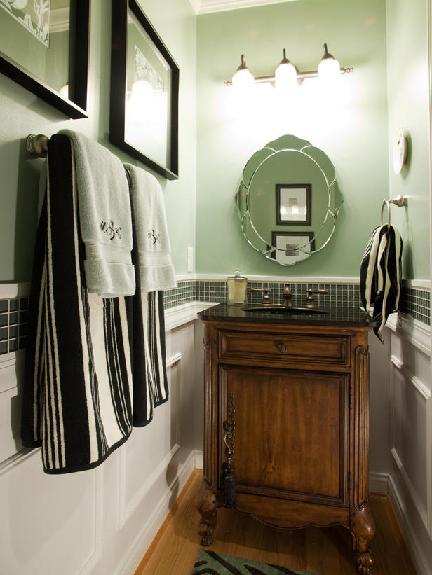 Sometimes I think about the practicality of having such bathrooms though, like having the towels exposed like that instead of inside cabinets or covered shelves. I'd be afraid to get them dirty before getting used. hehe. hmm...putting a cabinet for the towel is a good idea. i will check stores for that. thanks for sharing. Love the 2nd photo from the top. I want a t&b that looks cozy and chic in design. My husband and I are talking about our house renovation immediately after we fully pay it. That's about 5 more years. Well anyway, I want a much bigger bath room and I love the first photo.